We started with 18 riders but lost one at Shepperton ( If you are beginning cycling 38miles is too much of a challenge) and another 4 at Staines after a revolt by the 3 children. 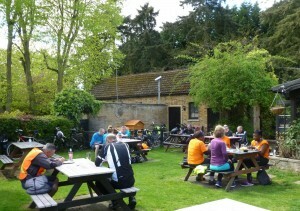 The remaining 13 of us made light work both of the hill up to Englefield Green and of a substantial light lunch at the Sun Inn. The ride through Windsor Great Park was a delight as was the twisty track down to Windsor with sunlit lime green foliage contrasting with purple clouds. Back to Twickenham at 4.30.